A local lawyer who has had a wealth of legal and business experience graduated with an MBA from Bangor University this week. 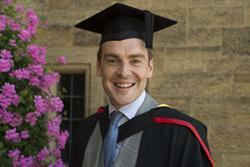 Rhodri Ogwen Morgan, 31, from Cricieth attained a distinction in his course and graduated with an MBA Environmental Management degree from one of the UK’s top Business Schools. Having followed the traditional higher education route, Rhodri graduated with a Law degree from Liverpool John Moores University followed by the Legal Practice Course in Chester before qualifying as a Lawyer in 2008. He subsequently worked as a locum lawyer and independent consultant in both the private and public sectors and specialised in Major Projects and Commercial work before returning to university in 2012 to undertake an MBA. Rhodri has also been awarded the Magnox prize of £200 for best overall student on the MBA Environmental Management course at Bangor Business School. Dr Gareth Griffiths, Senior Lecturer at the Bangor Business School, said: “Rhodri’s passion about the environment and business came to the fore during his MBA. His contribution to the programme was outstanding and his insight and application was first rate”. Proud with his achievement, Rhodri said: “Over the years many of my friends have attended and graduated from Bangor University and with its reputation as the number one Business School in the UK for research in the field of Accounting and Finance, Bangor was the logical choice for me. “I’ve always had an interest in business and having been involved with setting up and running various companies over the years I was interested in the MBA in Environmental Management qualification due to the relevance of it’s modules in the modern business environment. Over the years I’ve been fortunate enough to have had experience working with a variety of different businesses and sectors; from small family run businesses to large multinational companies both in the UK and overseas in the EU and Asia Pac regions. I consider that the MBA from Bangor University will be of great benefit to me in the future and would recommend it to other students considering undertaking a postgraduate qualification in business. “Whilst studying at Bangor, I also had responsibilities as a Director of a company I started with a friend back in 2011. The company specialises in the supply and distribution of heavy plant and machinery for a Chinese multinational in the UK. Although it was difficult at times, juggling the responsibilities of running a business and completing projects and assignments for the course, it wasn’t too bad. “Whilst undertaking my MBA, along with a fellow student, we secured a four month work placement with Magnox Ltd to complete our research dissertations in Change Management related Projects at the Trawsfynydd Nuclear Decommissioning Site. This was the highlight of the year for me as we were provided the opportunity of conducting primary research at the power station which in itself was a fascinating context and I feel very fortunate to have worked with some highly skilled and talented individuals. It truly was an awesome experience. “Another notable highlight was having the opportunity of working with highly experienced and professional individuals from a variety of different backgrounds. During the year I was fortunate to have worked and made great friends with a lawyer from Libya, an IT specialist from India, a nuclear physicist from China and a management consultant from the USA, not to mention all the people that I worked with at Magnox. The other highlight was achieving a distinction in my research project and an overall distinction in my MBA. “Like any masters degree, there are obstacles to overcome throughout your studies, from new subjects that you need to get a grasp of quickly and confidently to various deadlines that must be met, but overall I think this is what the MBA is all about; learning how to face obstacles and challenges head on and finding pragmatic and innovative solutions to these problems both individually and as part of a team. At the end of the day, business and management is all about working with people, overcoming obstacles and solving problems and I feel that the MBA provides students with an excellent opportunity to get experience of achieving this. Just before graduating, Rhodri undertook the Snowdonia 3000 15 Peak Challenge in support of the National Osteoporosis Society, the only UK wide charity dedicated to improving the diagnosis, prevention and treatment of osteoporosis and fragility fractures. The Welsh 3000 challenge challenges the participants to climb all 15 of the summits of Snowdonia that top the magic 3000 feet mark in 24 hours. The entire route is close to 30 miles long and involves over 13,000 feet of ascent.